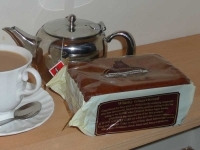 Gingerbread has been made in Whitby for the seafaring community since time immemorial, its good keeping qualities making it ideal for taking to sea. 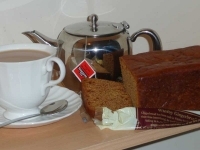 In 1865 when Elizabeth Botham began baking, gingerbread was naturally one of her first products. It is not a sticky cake but a firm loaf with a texture between a bread and a biscuit. Today we enjoy it thinly sliced, buttered and served with a while farmhouse cheese, lemon curd, honey or preserves. The gingerbread is not particularly sweet, and as such is able to take both sweet and savoury accompaniments particularly well. Its firm texture also allows it to be easily buttered, even with butter which is relatively unyielding. It may well also be possible to lightly toast the gingerbread, though out on top of a fell I was without a toaster and unable to test this theory. Whitby Gingerbread has a long history, and I for one hope it has a long future. This entry was posted in A nice cup of tea and... and tagged A nice cup of tea and..., Cake, Pennine Way, UK by Christopher. Bookmark the permalink. I have to agree with the Bothams statement the best bakery in whitby. but don’t try if you have difficulty walking.